I made a quilt this summer that I have not written about yet. I was on my fabulous road trip with Celeste when I asked Sue what fabrics Steve and Sally, her son and daughter in law, were using in their nursery. I had the thought of making an eye spy quilt for their nursery. So I wanted to find things that were in her theme for the eye spy blocks. She had chosen some soft grey fabrics and one print with elephants on it. Well on our trip, Celeste and I ran across a shop hop in the Salt Lake City. So on the shop hop we saw a quilt made up called Elephant Abstractions by Violet Craft. Click here to visit her website. On a whim, I sent a photo to Sue, and Celeste and I bought the pattern. I had been collecting grey fabrics to make a mountain quilt for Celeste over the last few months and I had already cut out the blocks for that quilt. So when I got home, I put out the fabrics and found some to use for the elephant. There were some that I wanted to use, that I didn't have enough fabric. The pattern showed a yellow background, but Sue did not think that would work with their color scheme. So I layed out various options I had in my stash and we picked the bright blue. When I got home, before I could start the elephant I needed to finish the eye spy for my co-workers first grand baby. Once I finished that I started piecing the elephant. There are 97 paper pieced sections int the elephant. And it is built in 6 sections. So I started with section one and tried to get a section done in 1 or two days. Lastly the feet had to be done. Violet Craft did not have a border on her quilt, but I decided with all those bias edges, to put a 2 inch border made of the background fabric on the quilt. I did not want it to get wavy, and it was laying pretty flat upon completion. 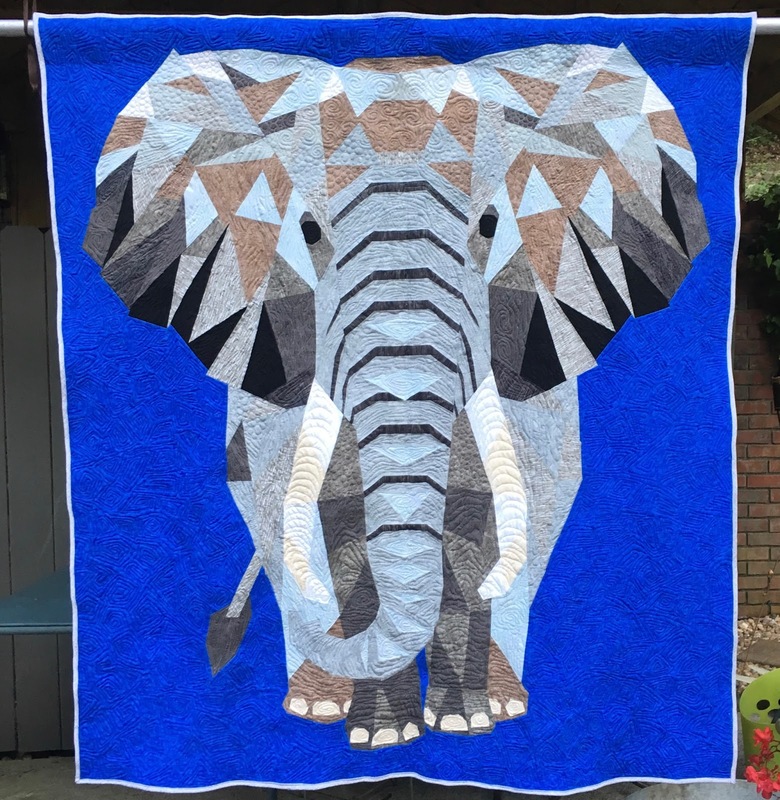 My original plan was to make a two sided quilt, eye spy on one side and the elephant on the other...but as I pieced it I decided I really would want to custom quilt that elephant. So I texted Sue and suggested we do it as two quilts...So when we were on our crafting week at her sisters, I quilted this elephant and made the eye spy quilt. I used the quilting in the quilt I saw in Utah for inspiration. It did seem to get a little wavy with the quilting. I quilted it on my Bernina 350. If we had had more time, I would have blocked it. 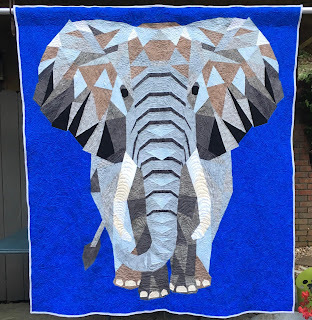 We named the elephant quilt "Squirts" I hope they love it, I had a great time making it, and it was a big stretch to do those large paper piecing and some of the quilting patterns were things I hadn't done before. My only regret was we didn't have time to block it. Click here if you want one. I quilted this by stitching in the ditch and putting a meandering stars in the border. 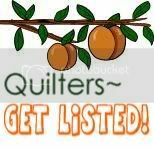 I also wrote his name in the quilting...I really do like to write with the free motion quilting. It is like leaving a hidden message.